Originally, I wanted to fly with Bangkok Air back to BKK and if I did I would save one day in Bangkok and headed straight to KUL on the same day. However, the airfare had increased since the last time I checked, it was about S$50 bucks more and that made me decide to switch to another airline instead. Flying with Nok Air on the return was an attractive option, but in the end I decided to add a new airline to my list and that would be flying on Thai Smile, a Low Cost subsidiary of Thai Airways. 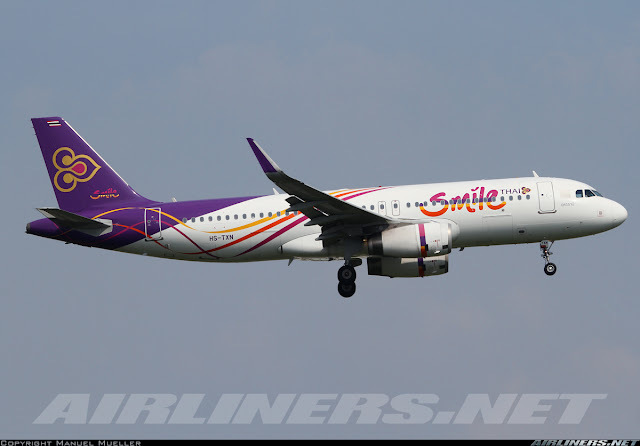 Thai Smile was formed to compete against the Low Cost Carriers such as Air Asia Thailand, Thai Lion Air and Nok Air. Thai Airways did have some shares in Nok Air but Nok Air has joined venture with Scoot instead and will be competing strongly against its once former ally. Flying with Thai Smile means I would be heading back to DMK and since I didn't want to rush back, I might as well stay a night in Bangkok and depart the following day instead. So it was back to Phoenix Hotel that day even though it was troublesome. Booking with this airline was an easy affair. No problems at all. Even though Thai Smile is under the management of Thai Airways, it used a different website and airline flight code from its parent. I stayed at the Chiangmai Plaza Hotel which was conveniently located at the heart of the city. The price for a night for a double bed room was pretty reasonable - US$40 per night. The room may be spacious but its pretty old and the wifi was not working most of the time. Despite voicing out my frustration to the staff at the lobby, nothing was done. Wifi is one of the most important thing in the hotel, if this hotel can't provide a proper one, then I won't be coming back next time. The good thing is this hotel provides with complimentary breakfast and it wasn't that bad. Some photos of my hotel, ChiangMai Plaza Hotel. After checking in, I went to the near by Bazaar for a walk and also grab dinner. It was a lovely day for walking. Enjoy the photos! First stop was at Anusarn Market which was about 5 minutes from the hotel. I enjoyed the local dish, Khai Soi (Egg Noodle Curry), coconut drink (very refreshing) and Mango Sticky rice which didn't disappoint. All at the cost of S$7, what a bargain. After dinner, I continued walking down the streets that lead to more bazaars. The next day, I took a walk around the area. I was blessed with good weather! Thanks to foursquare, I found a dessert place near this area and enjoyed a nice western dessert for a price of 90 baht. Passed by a few temples which were plentiful in this city. There is Burger King and Macdonald's in Chiang Mai but there was no way I was having my meals there. Quite a busy street but its not as bad as the traffic in Bangkok. My dinner at Duke's place, recommended by a friend. They served mainly western dishes. The portion was huge and I had a problem finishing it. Last visit to the market before I head back to the hotel. In the morning, I paid 140 bahts to the hotel for a taxi to the airport. For a hotel of this status, I don't understand why I need to pay for the ride. Its ridiculous! My next trip to Chiang Mai, I will stay in another hotel. Once I reached the airport, I took some photos of the interior. I have to try R Airlines the next time I am here. Not many of us (foreigners) are aware of this airline's existence! The land-side contains of 2 levels. Level 1 is where the check-in counters and arrival halls are, while Level 2 is where the Boutique lounge, Thai restaurant, some small shops and the departure hall are. Small airport and you can't get lost over here. Unfortunately, no free wifi. So its best to get a local sim card - pretty cheap for a period of unlimited data usage. Bangkok Airways Boutique Lounge: I hope to try this the next time I fly with this airline. I stopped by at the Thai Airways Restaurant and grabbed a bit. It was decent but overpriced. I recommend you to have your meal elsewhere before coming to the airport. A couple of fast-food restaurants at the airport; McDonald's and Burger King. Once I was done with the tour, I headed to the check-in counter. There were already passengers waiting. Do take note that for domestic flights, the check-in counters open 2 hours before departure. While waiting, I did a check what aircraft I would be flying on. Checking the history of this flight; HS-TXP, HS-TXO and HS-TXN fly on this route frequently and that is good news for me. It means "sharklets". Majority of the airline's Airbus A320 is equipped with "sharklets" so my chance is good. Thanks to flightradar24, HS-TXN would be flying me. Within minutes, I got my boarding pass. I wish Thai Smile has its own pass but at least its better than supermarket receipts. Once checked in was done, I made my way to the air-side. The air-side is small, few shops and a holding room where the gates are. There are aero-bridges here, unless your aircraft is operated by a turboprop, you should be using them. It was packed with passengers, most of them were heading to Bangkok and were a few other flights heading to the same destination. Do take note that only Bangkok Airways operate to BKK (Suvarnabhumi Airport), that's why the airfare comparing to others is more expensive. Gate 3, that's where my flight was departing from. Lots of the passengers were on other flights. Beautiful livery, isn't it? Chiang Mai Airport isn't photography-friendly in terms of capturing photos of aircraft inside it, the only way to photograph them is to head outdoors. Once boarding commerced, I made my way to the aircraft quickly. Getting to my seat early is always my preference as I can settle before my seat mates do. I was greeted by a crew of enthusiastic young Thai ladies who welcomed me warmly - nice good first impression and walking through the aisle to this cosy feeling cabin. Let these cabin photos do the talking. The pink colour head cover represents the Smile Plus cabin. Looks similar to the economy class right? The difference is the legroom space is generous, 33 inch and of course you have to pay more for these seats. Can you see the legroom space? Notice the empty space where the safety card is supposed to be? That seat is vacant which means even more space for the passengers. If you are flying on a longer sector, its better to book yourself on one of these 4 rows. Row 31 to 34. Walking through the aisle in this less than a-year-old A320. Do you like the seats? I think they are pretty nice. Warm and cozy is how I like to feel while flying. My seat at 52K, just behind the wing. The safety card is located at your eye level for easy reference. The airline's magazine is located at the seat pocket. I was delighted to have the 2 seats beside mine vacant. It turned out to be slightly more than half full, with lots of empty seats at the rear. The seat is quite comfortable and comparing this to my previous flight with Nok Air, this is much better. While the crew were welcoming more passengers on board, I was snapping more photos. The crew's working station at the rear. Drop-down screen was used on my flight. Safety video was demonstrated and later on during the flight, a program was shown. This airline doesn't feel like a Low Cost at all, its similar to Malindo Air in fact. In between a Full Cost Carrier and a Low Cost Carrier yet the air ticket I paid for is cheap. The seat pitch - tight as usual but bearable. Last row of seats at the rear, bad thing is these seats can't recline. This set of crew wasn't as good as my Nok Air's flight. They were pretty reserved but were friendly when I requested for something. I wanted to buy the airline's polo shirt but they told me they had no stock but I could get it at the airport's office. At least they were there to greet you before and after the flight which is quite important, making your guests feel at home. I heard negative reviews on this airline in terms of service but I had no problem with this set, all I can say its down to your luck. Just like on Nok Air, a snack bag was provided and I like the presentation of it. Doesn't the "sharklets" look great on the Airbus A320? Rolling down the runway for a quick 50 minutes flight to DMK. The beacon light was in action. Visiting Chiang Mai is a must for all foreigners especially outside Asia. Not only is it cheap, its a great place to relax; enjoying good food, massage and visiting beautiful sightseeing places. Adding on to this, the price you pay in Thailand, you can't get it in most places elsewhere! I had limited time but will return here hopefully with a few friends in the near future. Flying with Thai Smile gives me a different impression of the airline now. Used to think this airline is on par with other LCCs such as Jetstar and Air Asia. Now? I find it similar to Malindo Air - another airline that offers better cabin and also comes with free snack and drink. Malindo Air has an advantage though, IFE system on the back of every seat and you just need to use your earpiece. So if you are travelling in Thailand or flying out of it, you can consider this airline. Do take note that this carrier also flies on international routes. For more info, click here. Thank you for reading this trip report! Follow me on @JA815A on twitter for updates.